Something in the quality of the pre-dawn light told me that the world had been made new with a fresh blanket of snow. I love waking up to a clean slate. What furry or feathered stories will lay their tracks on it today? Artists, with their warmer, drier canvases, must have the same feelings of anticipation and eagerness to see a new creation emerge. As a child, I felt that way on the first day of school, too, with my stack of blank notebooks, ready for a new adventure. Even as the sun rose, there was already one mark in the snowy expanse of my front “yard”. Sticking out of the snow like a proud sentinel was the dried stalk from a common mullein plant. I’ve been watching it since last summer, when its yellow-flowered stalk was just a dab of color among daylilies, black-eyed Susans, and daisies. Today it was the center of attention while all of its companions lay resting under the weight of the drifts. Although this mullein stalk is just as dead (actually, even more dead) as its dormant neighbors, its sturdy, dry stem gives it a second life. This plant began during the summer before last, when a tiny seed found enough sunlight and bare soil to sprout. Mullein likes disturbed areas. Soon, a low circle of leaves, called a basal rosette, spread out on the earth. This biennial overwintered that way, with its leaves and roots hidden beneath the snow. A period of cold and dormancy is required to break down starch in the roots and trigger its next life stage. In the spring, a thick stalk began to grow out of the basal rosette’s center. Once the spire was chest-high, the lowest flowers, starting about half-way up the stalk, began to blossom in small clusters. Small and yellow, with five symmetrical petals, each flower only bloomed for a single day. It opened before dawn and closed in the afternoon. If a bee didn’t pollinate the flower during that short window, the flower did the job itself. With such measured restraint, a single stalk of mullein can bloom for an entire summer. Once that summer is over, though, the mullein is done. Each plant only lives through two growing seasons, while the durable, dried stalk persists much longer. Chickadees scattered from the bird feeder as I tromped outside to take a closer look at my sentinel in the snow. Up close, I could see tiny, roundish seed capsules split open down a center seam and clustered among the few dried flower petals still clinging to the top of the spike. Each of the hundreds of capsules can hold more than 700 seeds, each less than a millimeter long. The flower stalk’s usefulness doesn’t end after it goes to seed, though. Mullein is a notoriously useful plant among survivalists and other wildcrafters. For one, it provides everything you need to start a fire. The lower portion of the stalk becomes a spindle for a hand drill or bow drill. The thick base of big stalks can be split and used for the fireboard that rests on the ground and holds the spindle and eventual ember. The tough root can be fashioned into a hand socket for pressing down on the top of the spindle when using a bow drill. Once you get a hot coal, mullein leaves make excellent tinder. Held vertically on the stalk all winter, they are often dry when everything else is wet. Plus, their fuzzy texture provides ample surface area to ignite. Once you’ve coaxed a little flame, the uppermost club of seed capsules is useful as kindling. While mullein isn’t native here (Europe, northern Africa, and Asia are its home range), it has spread quickly since the 1700s, and is considered naturalized in most places. Native species as well as other newcomers find it useful, and it only threatens to take over where other plants are sparse. As I stooped near the flower stalk for a photo, another use caught my eye. Hidden among the seed capsules was a single, hulled sunflower seed: the food cache of a chickadee. Leaning even closer, I bumped the stalk and sent a shower of tiny black seeds onto the snow. They are too small for the chickadees to bother with, but goldfinches have been known to eat them. Most of the seeds will likely settle into the soil when the snow melts. With characteristic restraint, the seeds can persist for up to a hundred years. They wait for just the right conditions to sprout a new basal rosette and begin again. Their requirements? Bare soil, full sun: a clean slate on which to begin something new. A chorus of sharp honking sent shivers up my spine. 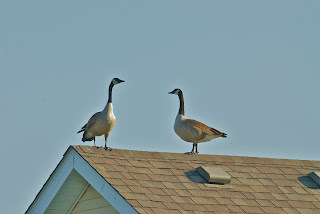 Looking up over the nested rows of suburban homes, I scanned the low, gray sky until the V of geese came into view. Their wild calling seemed out of place in my brother’s orderly, central Iowa neighborhood, and my brain flashed back to a crisp September day in the Boundary Waters of northern Minnesota. Three canoes floated among yellowing lily pads and tree reflections in a cozy bay, while the fourth canoe landed and began unloading for the portage. My dad was the first to hear the geese, as usual. He’s always been tuned in to their music. We all shifted expectantly toward the sound, gently sculling paddles and maneuvering boats to ease the strain on our necks, but saw only the dense spires of spruces and blue sky. A few moments passed before the flock’s vanguard came into view, and they pulled their followers forward until the long ends of the V trailed over our heads. Taking stock of the early afternoon sun over my left shoulder, I noted with satisfaction that the geese were heading south. The urgency we imagined in their voices felt appropriate after our trip of windy days and chilly nights. We, too, would soon head south to wait out the winter with warm beds and plentiful food. 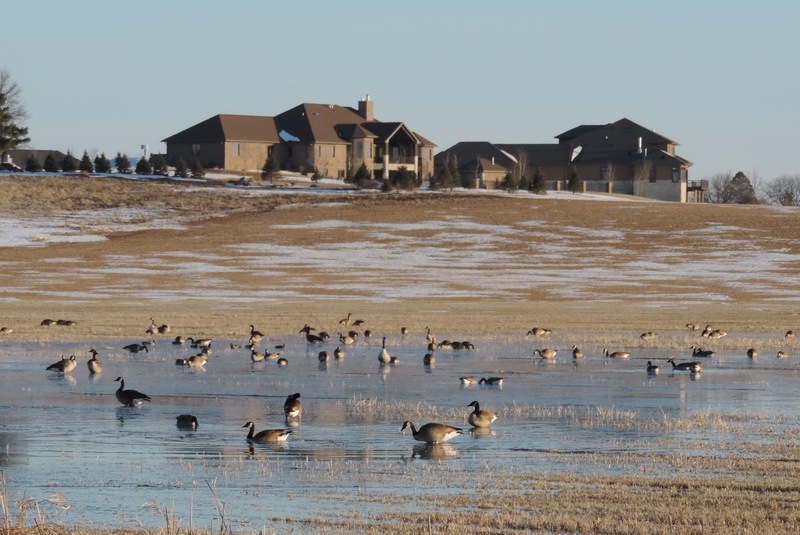 So what was this skein of geese doing—flying north, no less—in February, in a subdivision, less than 150 miles south of the latitude of Leopold’s shack? As humans have changed the landscape and the climate, some of the 11 subspecies of Canada geese have changed their patterns to match. Many geese who breed in the far north do still migrate long distances. Other northern populations migrate, but don’t travel as far south. The southernmost breeding populations don’t participate in winter migration at all. This shift may be due to newer farming practices that leave more waste grain (a favorite food of geese) in the fields, more year-round open water near dams or industries, and a decrease in snow cover on the tasty grass of our lawns, golf courses, and parks. 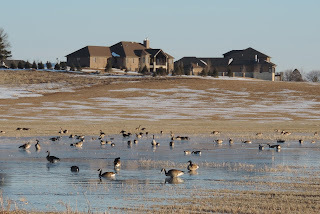 My guess is that the honking flock over suburbia was headed north to the Saylorville reservoir, or to the windswept farm fields disappearing under the creep of development. 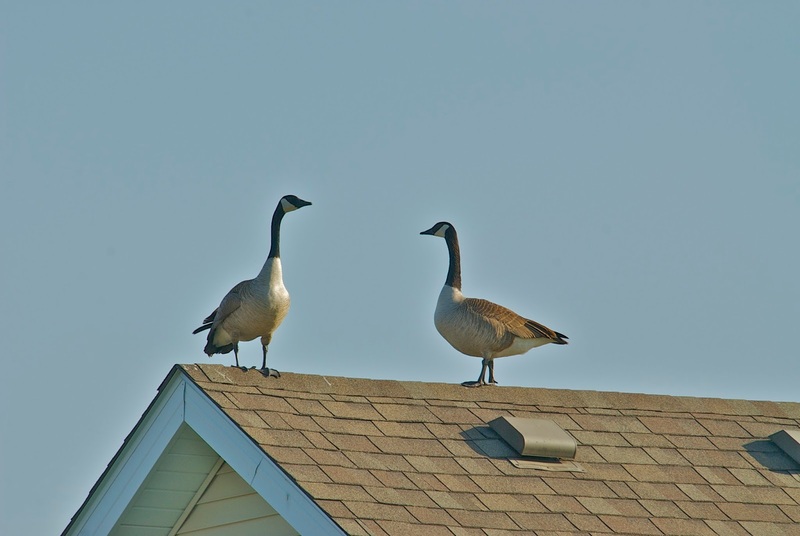 Living near people has proven to be beneficial to the resident geese, since cities provide tender green lawns with a wide-open view, a reduction in predators (including human hunters), and occasional supplemental feeding. Migrating geese must contend with the treachery of travel, predation, storms, and hunting. Their numbers seem to be held in check, while the resident geese are an increasing nuisance and hazard. Goose poop bringing coliform bacteria to swimming beaches and drinking water, and crop damage are two complaints, but it gets more serious than that. Some resident goose populations crowd out other migratory waterfowl in the wildlife refuges that were created to support them. In 2012, there were 240 goose-airplane collisions, and in 2009 a flock of geese took out both engines on a US Airways plane and forced the pilot to make an emergency landing on the Hudson River. What’s fascinating, though, is that almost all geese—migratory or not—make short journeys north in late summer after breeding to munch on plants in an earlier state of growth. The younger plants contain additional nutrients needed to fuel the geese’s molt and feather re-growth. Migratory vs resident. Wild harbinger of seasons vs common nuisance. Even with Canada geese, nothing is just black or white. Canada geese have adapted well to living among humans, and some populations no longer migrate with the seasons. Photos by Larry Stone. Late afternoon sunshine flooded through an aspen grove as we chugged up a hill on the Hartley Nature Center ski trails in Duluth. The warmth of a January thaw still hung in the air, and we paused to bask in the glow at the summit. A sprinkling of debris coated the surface of the softening snow. Suddenly one of the little specks vanished. Crouching down for a better look, I discovered that most of the sprinkles were tiny, leaping springtails known as snow fleas. While springtails have six legs, they aren’t insects. Instead, they belong to the insects’ sister group with several different characteristics. A lack of wings, simple instead of compound eyes, differences in molting, a special mouthpart for drinking, and a hinged body part that can fling them into the air set springtails apart from true insects. A springtail’s namesake spring is actually two modified legs on their final body segment, which form a forked appendage called a furcular. While resting, a springtail locks the prongs of its furcular up against its belly, thereby storing potential kinetic energy in its abdominal muscles. A rubber-like protein called resilin in the springtail’s exoskeleton helps to flex and store energy, too. The whole system is similar to an upside-down mouse trap. When the springtail is startled by a potential predator, such as a giant human skier, it releases the clasp and the furcular snaps open against the ground. The critter launches into to the air, as far as 100 times its one-eighth of an inch body length. This erratic movement caused the mysterious, vanishing specks I noticed on the snow. After an uncontrolled flight, a springtail might land mere inches from its starting point, which is still far enough to fool many of its predators—like ants, beetles, and salamanders. Post fling, springtails don’t always land on their feet. Luckily, they have a neat trick for righting themselves. Two inflatable grooming tools not only help them to keep clean, the sticky tubes can be adhered to the ground and used to pull the springtail upright. While springtails are in the running to be the most abundant of all macroscopic animals (you might find 100,000 individuals in a square meter of soil, and there are about 3,600 species total), we typically only notice the one or two species who spend time on the surface of snow. 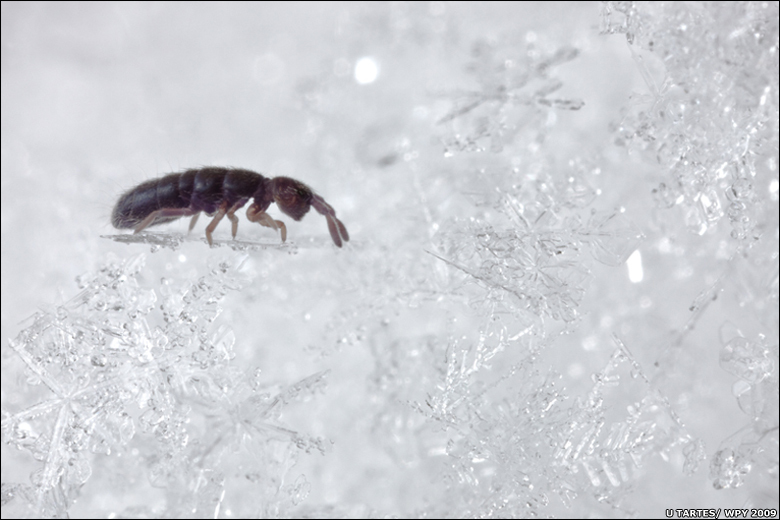 Snow fleas get their name from their jumpy behavior and the substrate that makes them visible. On balmy winter days, snow fleas scatter like pepper over the surface of the snowpack, or they might congregate in crawling hordes of a million individuals, drawn together by pheromones for mating party. It’s amazing that such a tiny thing can survive at all in the frozen expanse of snow. The magic that makes this possible is a unique protein especially rich in the amino acid glycine. This protein binds to ice crystals as they start to form, preventing them from growing larger, and so it acts as an antifreeze. The protein works down to about 21 degrees F, and at warmer temperatures it disappears! Doctors are studying its potential to help preserve human organs on their way to a transplant surgery. Snow fleas don’t really spend much of their life on top of the snow. Like other springtails, they inhabit the soil and leaf litter. Other species of springtails (not snow fleas) live in tree canopies and even on top of water. A moist environment is essential to prevent desiccation. Since they breathe directly through their skin (another difference from insects, who use a trachea), springtails must balance hydration with breathing. Complex structures on their skin trap tiny, durable reservoirs of air. In their damp habitats, springtails are essential members of the community. What they lack in size, they make up for in numbers. They fragment organic material and make it easier for decomposers to break down. Springtails also curate the soil’s microbial inhabitants by eating bacteria and fungi, and by spreading them around. One common fungus—Laccaria bicolor—has turned the tables on springtails, though. This fungus paralyzes and decomposes the springtails, then sends their nitrogen over to a white pine through its roots. On your next sunny adventure in the winter woods, be sure to keep an eye out for tiny, leaping specks on the snow. They just might be more interesting than you’d expect! Snow fleas are more interesting and important than their small size would indicate. Photo by Urmas Tartes. Sometimes when the wind howls, snow swirls, and ice coats the roadways, it’s safer to experience nature from the comforts of your home. One of the ways you can do that is through the Museum’s Virtual Exhibit. For the past three years, a group of Museum staff and volunteers have been doing the tedious but important work of cataloging most of our collection of museum specimens in a digital database called Past Perfect. Whereas each bear mount, bird study skin, pressed plant, and insect in a vial used to have just a number and some papers in a file folder, each specimen now has a photo and digital record. These records are available to the public through our website at: cablemuseum.org/virtual-exhibit. This project is part of a Museums for America Grant from the Institute for Museum and Library Services. While it’s fun to browse through the photos of taxidermied mammals and check out our collection of fish, my favorite part of the Virtual Exhibit is that you can view many of our most fragile and delicate collections that may never go on display inside the actual Museum. For example, our collection contains a slide show on spring wildflowers put together by Lois Nestel herself. Lois was a self-taught naturalist and the Museum’s first director. As legend tells it, the idea for the Cable Natural History Museum was born when Mrs. Mary Griggs Burke, a local philanthropist, attended Lois’s wildflower slide talk and determined that this incredible naturalist needed her own Museum. The generous funding and lofty ideals that Mrs. Burke used to jumpstart the Museum continue to inspire us today. Reflecting back on her experiences, Mrs. Burke wrote, "I am glad more people are enjoying the beauty of nature—but only if people value the land and treat it with respect can they preserve what they enjoy"
Lois’s legacy lives on in many other specimens, too. Her watercolor paintings of flowers, mushrooms, and birds are delightfully beautiful and technically accurate. These, too, can be viewed through our Virtual Exhibit portal. Besides looking through classic groups of collections like mammals, birds, fish, reptiles, and even mussels, you also can view virtual exhibits based on our recent Museum exhibits--“Nature’s Superheroes,” and “Lakes Alive!” What’s fun about these online exhibits is that they pair photos of the specimens used in the physical exhibits with information taken directly from the text panels. If you’re forgotten the fun facts you learned while visiting the Museum, or if you weren’t able visit our previous exhibit, you can explore them online instead. Having 2,270 items from our Museum collections available in a searchable online database isn’t just for self-edification on a snowy day, though. It serves some higher purposes as well. For one, our Naturalist/Curator, Elsa Hansen, now can access all of our records from the ease of a computer interface instead of dusty old files. This is a huge improvement and a major accomplishment for our little Museum. Organizing and completing our collections database was one hurdle on our way to becoming accredited with the American Alliance of Museums (AAM). We hope to execute the rest of the process this spring. Why is taking care of our collections so important, anyway? Museum collections play a vital role in scientific research on biodiversity, evolution, population genetics, and even things like climate change and pesticide use. When peregrine falcons began to decline, it was museum specimens of eggshells that allowed researchers to confirm that DDT was the culprit and get it banned. While many of our collections were acquired before DNA testing was an option, scientists now can go back and sample old specimens to get new information. Using DNA, they can discover how populations have changed over time, and sometimes even discover new species! In order for our collections to be useful to scientists, though, they have to be well taken care of and well documented. Whether your purpose is scientific research or satisfying curiosity, museum collections are vital in today’s changing world. We invite you to explore ours from the comfort of your own home. The Cable Natural History Museum’s Virtual Exhibit can be viewed at: cablemuseum.org/virtual-exhibit. Lois Nestel's orchid paintings are one of the many fragile and hidden-away Museum collections that you can view using our Virtual Exhibit.